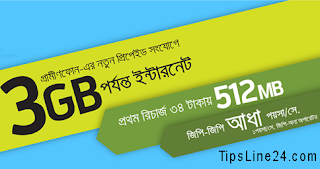 Grameenphone lunched amazing offer with new SIM. With every new coonection you can enjoy up to 3GB Internet data & lowest call rate 0.5Paisa Sec GP-GP and 1Poisha Sec to Other. From 23 May 2017, All new Grameenphone pre-paid (Nishchinto), Djuice, Ekota 1, 3 and BS 1,3,4 (Shofol) & 5, Bondhu, Grameenphone Public Phone and Village phone connections will enjoy following offers. To check the pre-loaded talk time dial *566# and for bonus dial *121*1*2#. For internet, customer will be charged at BDT.01/10Kb, up to BDT 200. Upon expiry of special tariff, customers will be able to enjoy the main package call rate. While enjoying the special lower tariff other lower tariff offers will not be applicable. Lower tariff is not applicable on bonus amount, bonus minutes or Emergency Balance and these will consume first. The first recharge offer is applicable only for the first time, after which the 34 Taka recharge offer will not be applicable for the subscriber. During the campaign period above mentioned recharge points (9 Taka, 34 Taka) are only applicable to the eligible new subscribers and will remain restricted for all other customers. 54 Taka recharge point will also be restricted for all customers. Customers will be eligible to buy 512 MB Internet for only 9Tk (inclusive all charges). Customers need to recharge exact 9 Tk to get 512 MB with 7 days validity. Customers can avail 512 MB Internet for 9 Taka (inclusive all charges) offer only once in one calendar month. . Eligible period is five Calendar months and it starts from the date from his activation date.